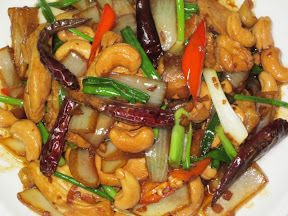 A nice and decent dish for dinner with your friends is Fry Chicken with Cashew Nuts. This is perfect for proper dinner in case some of your guests do not like spicy food. If you want to have it extra hot without hurting the others I added the fried dry Chili, but this is optional. Fry the garlic on vegetable oil, when it gives the aroma add the chicken meat and fry with medium heat until the meat is almost cooked, add the onion. Season with Soya Sauce and black Soya Sauce for coloring. 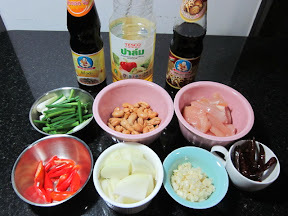 Add the chili, cashew nuts and spring onion and stir the entire ingredient well. How to peel the meat off a fish ?